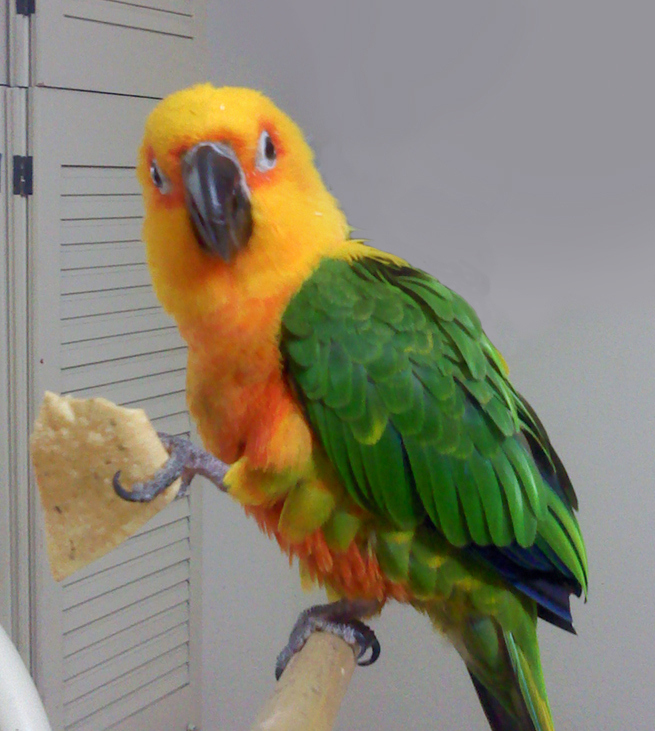 This bird definitely has a chip on his shoulder! One of the harder aspects of going through a divorce has been trying to alleviate the suffering brought upon my children by change. I’d like to think that my children have learned to become more resilient and independent with the change thrust upon them as a result of my decision to divorce. They certainly were forced to grow up quickly. For a long time I held them back, which added to my guilt. Thankfully, I’ve let go of much of that anguish. It’s been very difficult for me not to spin stories in my mind about the effect divorce has had upon my children. But mindsets can be adjusted. I remind myself that prior to divorce, my children simply witnessed a sad marriage. Staying married because it was “best for my children” (and parents) was the story that I believed in and followed for over thirty years. But I have no regrets about any part of my past life. I simply am grateful that I had the courage and clarity about what I wanted for the rest of my life. I separated from my husband (by choice) ten months ago, and my oldest son (who is 22) chose to live with my husband. My daughter chose to live with me (she is 19) and my youngest son (16) is with me during the week and sees his father on 3 out of 4 weekends. 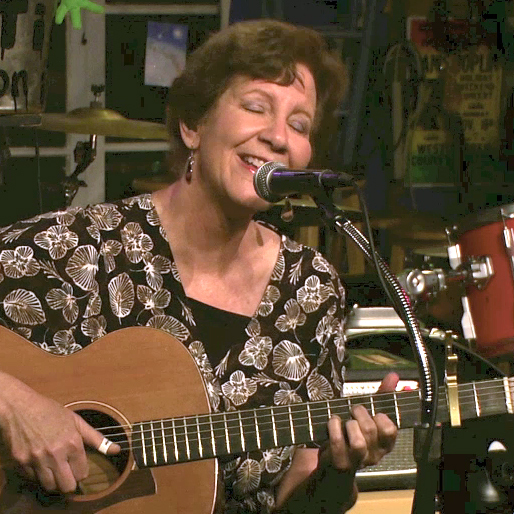 When I moved out, I fled the noise and wrote a song that I originally named “When Noise Turned to Music.” In my former life, I was overwhelmed by the constant bombardment upon my senses; the television was always on in my bedroom and everyone was usually yelling to be heard, including me. On top of that, we owned a parrot that continuously shrieked and a Chihuahua that yapped at me whenever I came near him. There was constant stress from two cats; one vomited frequently, so I constantly had to watch where I stepped. The other one urinated all over the house. I’m sure that poor creature felt stressed and was probably acting out. 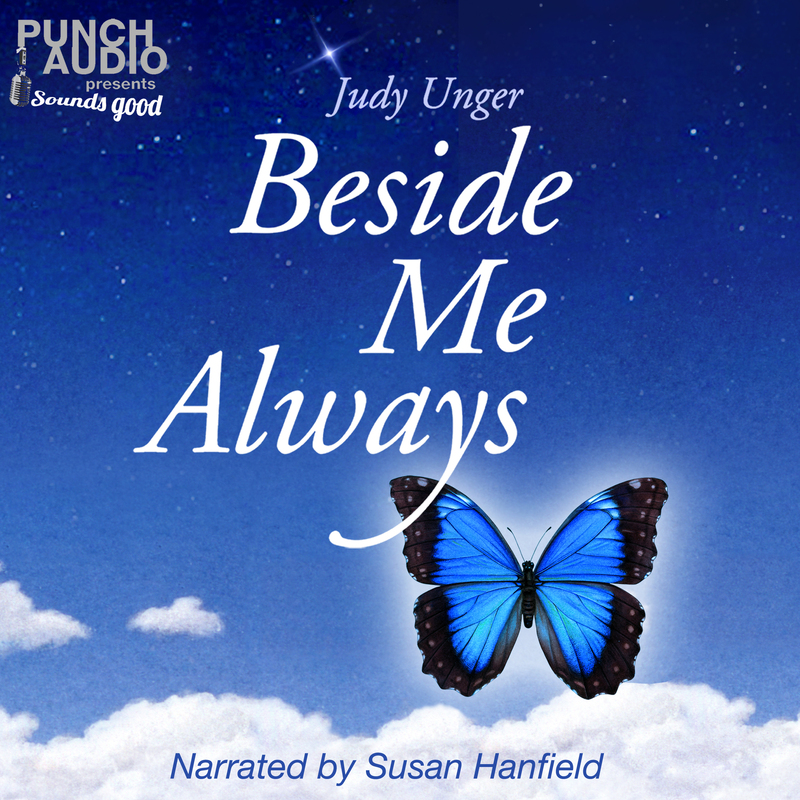 I mentioned my childrens’ suffering when I began this story. One of the saddest adjustments for them was the loss of their pets; only the Chihuahua has stayed because he is my husband’s constant companion. In order to sell our home, the two cats needed to go first. I wasn’t able to help much with finding them a new home. At the time, I had just moved out and was trying to set up a home for my two teenagers. I was also recovering from three cataract surgeries, with unrelenting complications. I tried contacting a few places that adopted cats, but had little success. Who wanted two cats that messed up a house? My oldest son was devastated, and went to pet adoption locations every weekend. He sat all day long next to a cage with two terrified cats without a single person expressing interest in adopting them. But after several months, my husband and son found a rescue organization that helped place those cats in a home where they could be together. It truly was a miracle. A month later, my oldest son was elated when he heard the cats had adjusted and were doing well. It was such a relief for him and for everyone in our family. After our home sold two months ago, my husband decided to live in a small condo with another couple. He rented a room from them and put most of his possessions into storage. Initially, it was going to be temporary, but recently he decided he would stay where he is for another two years. After that, he told our children that he planned to retire and move to Mexico. That was his dream. He told them he would send them plane tickets so they could come to visit him on the beach in Acapulco. This picture was taken five years ago. It’s been tough for me to watch my oldest son adjust. We were very close when my father died 15 months ago, and it was my son who found out I wanted a divorce before his father even knew. I know that he deeply wants to be there for his father. I’m so proud of him for being so loving and devoted. Only a few months ago, he graduated from college. Since then, it has been extremely stressful for him to find a job. He is desperate to change his circumstances and complains bitterly that he hates being dependent. There is no privacy where he lives; he sleeps on the floor sharing a room with his father. I told him he was always welcome to live with me. He said that my coop was a palace compared to the 800 square foot apartment where he currently lived. There were even more people there on the weekend, including my youngest son. It was ironic to hear that, because my coop only had two bedrooms. Before I moved in, I created a third bedroom for my youngest son by having a wall built to separate it from the living room. The other half of the living room was my office and truly my living space. Recently, I bought a futon and put it in that area so my son would have a more comfortable place to sleep (instead of an air mattress) whenever he came over. More and more, I have encouraged him to “take a break.” He was grateful for the peacefulness of my coop every time he visited. But it was clear, he did not want to hurt his father. His unspoiled nature amazed me, but at the same time saddened me. He was joyful and so appreciative that I had frozen burritos for him in my freezer. He slept in his clothes and never complained about sleeping on the floor. I tried to be patient, hoping his circumstances would change. At the same time, I continued to gently coax him with positive statements and encouragement. I saw my daughter blossom from her six-month paralysis after we moved, which gave me hope. What prompted me to write today was that I wanted to tell a touching story about adjusting to change and where it could lead. Two weeks ago, I took small steps to help my oldest son. 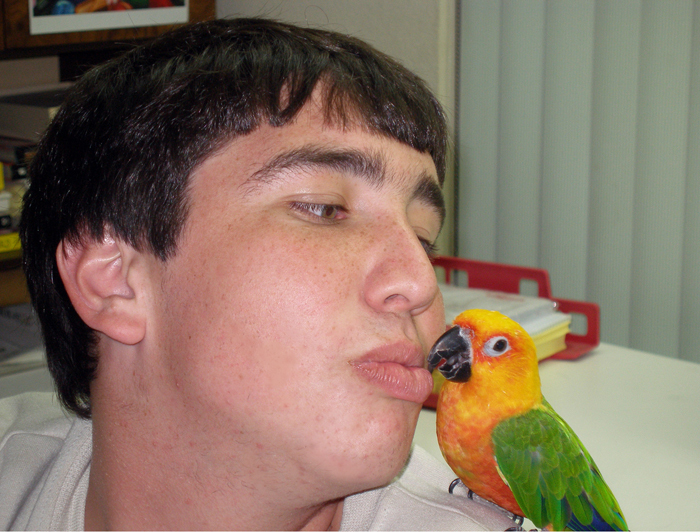 One of the greatest stressors in his life was the parrot that he loved. Keeping Tiki in a tiny apartment with many other people was quite challenging for him. But Tiki was his best friend and the epitome of unconditional love. He did not want to lose the last vestige of his former life. But pressure was mounting for my son. The neighbors where he lived were complaining about the bird’s screaming noise. The bird was often subjected to cigarette smoke and was left alone a lot of the time while my son looked for work. I knew my son was suffering. He was required to bring the cage outside and inside every day. One night he called his father to ask “permission” to stay over at my house. He wouldn’t be home to bring the cage in that night and his dad was upset with him. I racked my brain and convinced my son to let me help him. I found a bird store that boarded birds for $5 a day, and my son agreed that Tiki could stay there until his father moved into a new place. That night, he brought the cage and put it out on the patio of my coop. 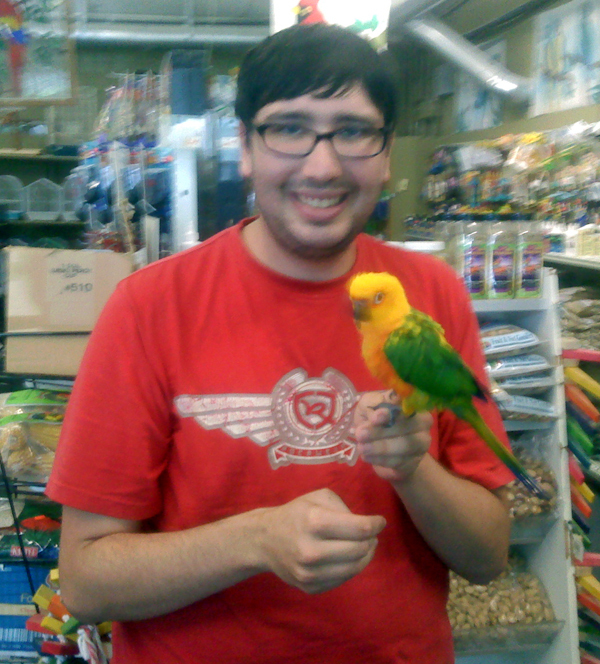 In the morning, we planned to bring Tiki to the bird store where he would be boarded. It was that night, when I learned that my husband’s situation was not all that temporary. Now it looked like it would be best to find Tiki a new home. My son seemed resigned to the situation. He didn’t cry or show how heartbroken he was, but I could feel his anguish. The next day, Tiki left my son’s life. I told the owner of the pet store that if anyone was interested in adopting Tiki, we would be grateful. The owner told me it was unlikely because Tiki was so aggressive. Keeping him at my coop simply was not an option. Although I had showered with that bird for two years, I was reminded again how loud he was when I had him that one night. I fully expected to hear complaints from my neighbors when Tiki began screaming as the sun rose early in the morning. It reminded me of how grateful I was for the peace and quiet of my new life. It looked like finding a home for Tiki wasn’t going to be easy. 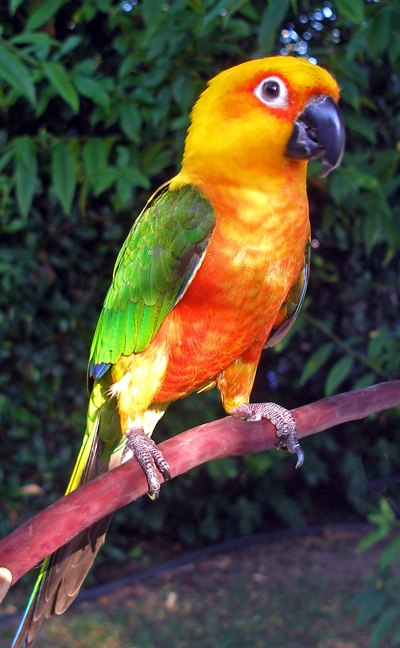 Since Conures can sell for $400, I started with an ad on Craigslist for $200 and a week later lowered it to $100. I had not a single response. The boarding fee was going to keep adding up and most importantly, I wanted Tiki to have a good home. On a whim, I decided to list him for free. I posted an adorable picture of him, which is below. I took that picture in the backyard of my former home. I didn’t write that he loved to draw blood and was very aggressive; or that his screeches were worse than fingernails on a chalkboard. I broke away from my computer to run an errand. When I came home and sat down at my computer, my jaw dropped. I’d never seen my email “inbox” with over 200 messages before! Thank you for your interest in Tiki. He unfortunately is very loud and can bite. I’ve received over 100 messages and haven’t decided yet. If I don’t find him a home by the end of this week, I’ll let you know. Many of the messages piqued my interest. I created a folder for the best ones. There were at least fifty messages in that folder. After I sent my honest message about his character flaws, I still kept receiving messages from people wanting Tiki – they didn’t really care if he was aggressive. Hello! I am interested in your little birdy. I want to provide a home for him or her she/he is so cute and gorgeous. Please let me know how we can make arrangements. Thank you! 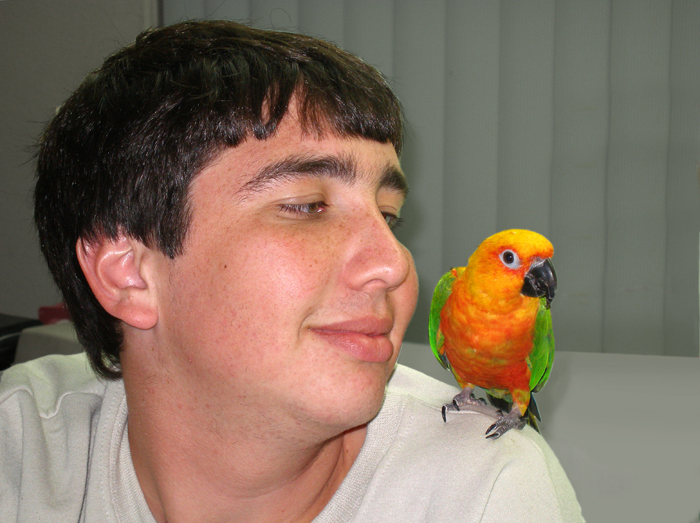 I am very interested in your beautiful little Conure. I had one before but I gave him away to my sister to keep her company, now I am disabled and I have been looking for a parrot to keep me company, since I am home all day. I know that they need a lot of attention and I can teach him many tricks and he can learn to talk. So you can see that I will be a good match. I’m very interested in giving Tiki a great home. I love birds as well as my mother. Please contact me for pick up. Thank u so much. HELLO:) HOPE YOUR WELL..LOVE YOUR BIRD..IF U HAVENT FOUND A HOME..I HAVE THE PERFECT HOME 🙂 MY MOM LOST HER BIRD YEARS BACK.. I WANT TO GIFT IT TO HER..
You always can call and ask for him, and stop by and visit him. You will always be #1 and I give you my word. All my family will give him a lot of love and care. 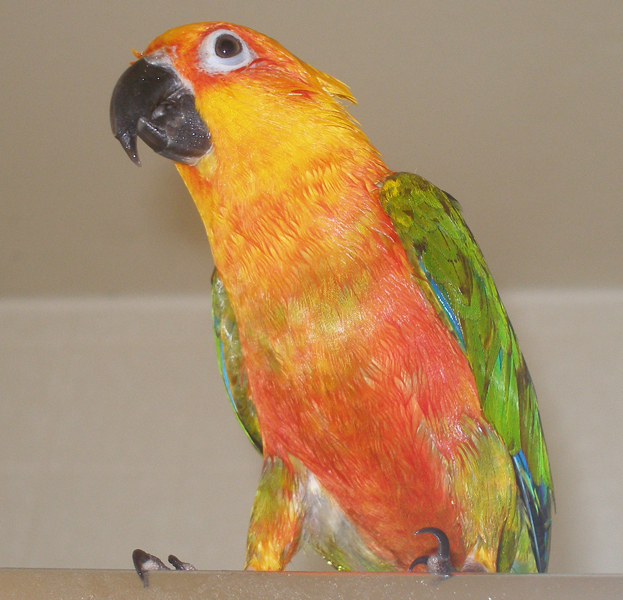 Hello I am a vet tech student that can provide a loving caring home for this sun conure. THANKS. WE HAVE AROUND TEN BIRDS HE WILL HAVE A GOOD HOME HERE. THANKS. We have a ranch. My neighbors have horses, so loud is not a problem. Also we are used to bird bites. LOL, my son’s parrot does that occasionally. I wanted my son to choose the best person. I was excited that he had so many choices and hoped that involving him in the process would help ease his sorrow. When I called him and mentioned my free ad, he became irritable. He said he wasn’t rushing to do favors for strangers. I told him I’d interview and choose someone, because at that moment I changed my mind about involving him. I could see it was too painful. But he still wasn’t interested. I called him back and apologized. I told him that I knew this was hard for him and I would be more patient. I will let you know when my son is ready. He’s having a hard time with it and it’s a tough choice! My son did not visit me that week. The following week he called and said he would visit for two days. While we were on the phone, I gently asked him if he felt ready to let go of Tiki. He surprised me and said yes; he told me he would appreciate if I picked someone. I decided that what was most important would be finding someone who lived nearby. That way my son could visit Tiki. I waited until the night before he came to send out a message. I wanted to be sure in case he changed his mind. That night, I sent an email to five prospects. They all lived nearby, so I asked them if I could set up a time to visit them the following day. When my son showed up at lunchtime, it was interesting that I had not heard back from any of those five people. I was surprised considering the intensity of receiving so many messages from them earlier. Two hours later, I realized I needed to dig deeper. It was already 2:00 p.m. and I glanced at my folder with dozens of messages. One stood out for me. This woman mentioned she was sorry about my divorce. I liked her compassion. She had written her phone number, so I decided I’d just call to see where she lived. She had a different area code and I thought it might be closer to where my son was living with his father. Suddenly, this woman began to scream. She was squealing and laughing and practically dropped the phone. She behaved as if she had won the lottery! Her bubbly words spilled forth non-stop. She raved about how much love her family would give Tiki. Over and over she exclaimed, “Thank you, Lord! Thank you, God!” In her words, everything happened in a way where God led Tiki to her. I listened and smiled; it actually was a puzzle how I had called her out of so many possibilities. I wanted my son to hear how excited she was, and he was in the same room with me. I handed him the phone and was surprised when he began to make arrangements for her to pick up Tiki. I motioned to him and told him to wait. I wanted to find out where she lived because there were so many other good prospects. He handed me back the phone. When she told me where she lived, my heart sank. She lived almost an hour away. With coolness in my voice, I told her I would let her know. There were closer prospects I planned to interview and my son and I needed to think about it. Her voice halted and quivered as she said, “Really? Are you telling me this isn’t for sure?” Her disappointment was so palpable that I thought she might start crying. After her story, I sighed and relented. A few minutes later, I hung up the phone. I had given her husband directions and the whole family was on their way. An hour later, a van with four people drove into the parking lot of my coop. My son and I came out to meet them and the plan was that they would follow us to the bird store. The woman’s name was Connie. She ran to meet me and hugged me tightly. Her eyes were glistening. At that moment, I knew I had made the right choice. My son was given the royal treatment. His eyes were bright as he thanked her profusely. He told her that he only wanted Tiki to have a good home and was so glad to know she would take such good care of him. 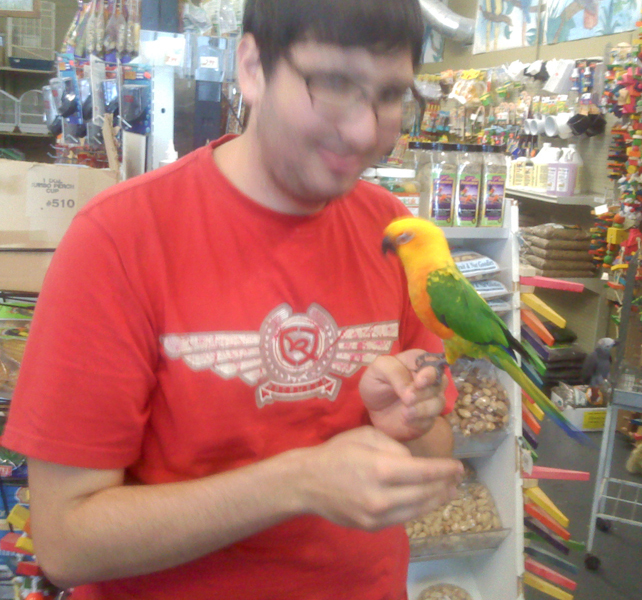 When we arrived at the bird store, my son was excited to see Tiki because he hadn’t seen him for two weeks. Tiki danced joyfully and their reunion was beautiful to watch. I took their picture, but it came out blurry. I told my son I planned to write and share this story. The family paid the two-week boarding fee, and we gave them bird food. It was finally time to say goodbye. My son put Tiki back in his cage. Before they left, we gave them all kinds of information about Tiki. We wanted to be sure they knew about his favorite snacks and ways to get him to come out of his cage. He shook his head. He wanted to see where Tiki would be living and he felt welcomed. I understood. The best moment happened before they drove away. Connie gripped my son’s hands and looked him right in the eyes. When she said that, I felt tears trickling down my throat. This entry was posted in Uncategorized and tagged adjusting to divorce, Aggressive parrots, biting parrot, bravery, change, children and divorce, conures, coping with divorce, courage, divorce, giving up a pet, inspiration, loss, Parrot Behavior, parrot bites, Parrots, pet adoption, pet bird, pets and divorce, sharp beaks on parrot, sun conure, Tropical Birds. Bookmark the permalink.